1. Laboratory examination: it mainly examines liver disfunction of obstructive jaundice, for example, increase of bilirubin or alkaline phosphatase. 2. B ultrasound: B ultrasound can display dilated bile duct or obstructive position through repeated and careful examination, even indicate the tumor out. 3. MRCP examination: MRCP can largely display the full view of intrahepatic bile duct tree, the position and scope of cancertous obstruction, whether there is encroachment of liver parenchyma or liver metastasis and so on; it is helpful for distinguishing duodenal papilla tumor and cancer of pancreas head. 4. CT examination: CT examination can accurately display cholangiectasis, position being obstructed for bile tract and its scope, and define the identifications of lesion. 5. 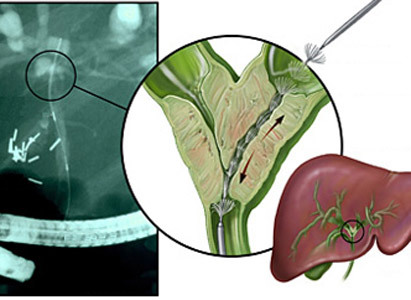 ERCP examination: ERCP examination can get to know the general status of the whole bile tract and also collect the bile and the fallen-off bile duct cancer cells. 6. PTC examination: PTC examination can clearly display the morphous, distribution of intra or extra-hepatic bile duct tree and obstructive position as well, so it is an accurate method to diagnose bile duct cancer.